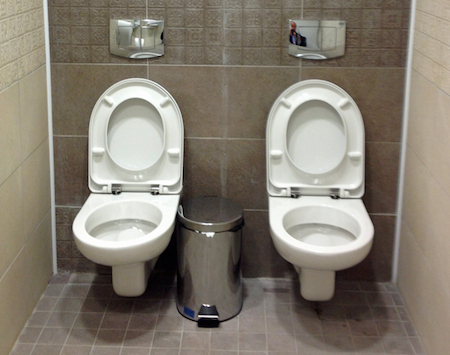 It was almost two years ago that I posted about the Toepener and StepNpull, both of which appear to have functioning websites, and both of which promise a hygienic way to open bathroom doors with your feet. 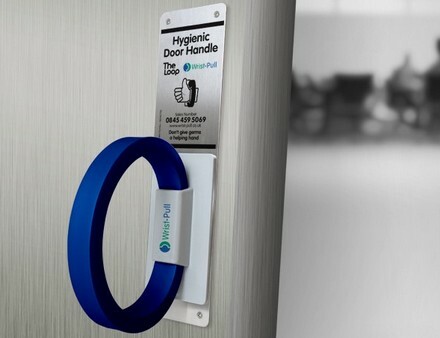 Enter the WristPull, a hygienic way to open doors with your wrist, which frankly might be a little more convenient for those of us who are a bit sketchy in the balance department. Except with a Twitter account that hasn’t updated since June, and a non-functional website, I’m not convinced these guys are even still in business. All hail our foot-based hygienic door-opening overlords? 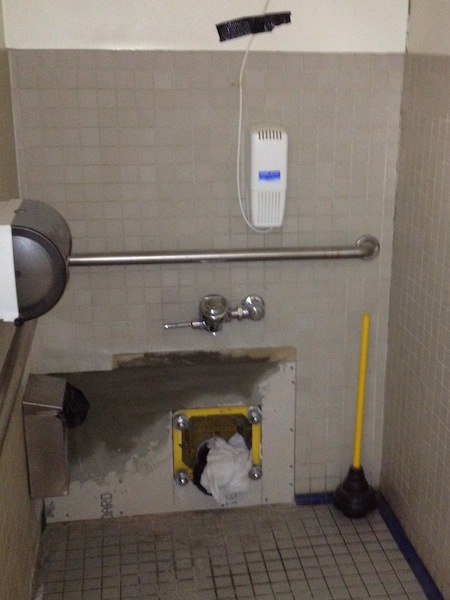 Disneyland has an awesome secret restroom! Okay, it’s difficult to call something a secret when it has a rather extensive website devoted to it, but Disneyland’s Slightly Off the Beaten Track Restroom doesn’t exactly have the same ring to it. The moment you open its door (assume it’s unlocked), you will be overwhelmed by just how enormous the Secret Restroom is. 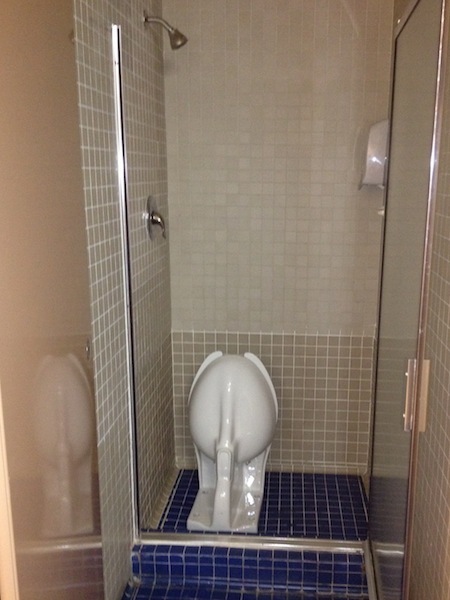 As a point of fact, the Secret Restroom is not only larger than the average American home restroom, it’s larger than the typical Anaheim apartment that can be afforded on a Disneyland castmember’s starting salary. 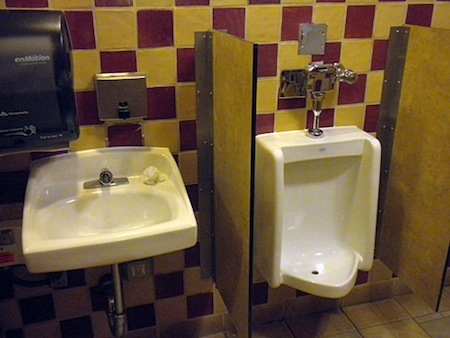 Because the Secret Restroom is cleaned every half hour, it is always in a state of perfection and readiness, and even a glance shows the luxuriance of its copious amenities and artistic touches (each of which is detailed elsewhere on this site). 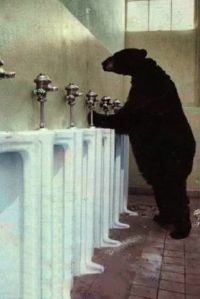 Heaven is a place where they clean public bathrooms every thirty minutes! There’s a lot of things I would buy used, but I’d never buy a used toilet – and I don’t think I’m the only one that feels that way. 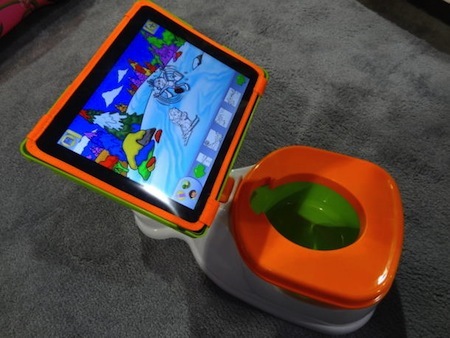 So what happens to old toilets? They end up in landfills, but that might start to change if the city of Bellingham has anything to say about it. 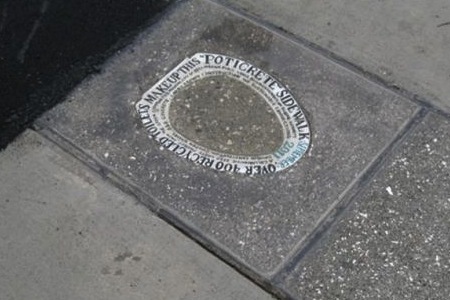 That’s right, they used poticrete – concrete mixed with 20% recycled toilets – to complete part of a trail system in the city. This may not save the world, but it’s a start! Read the entire article and check out more sweet pictures here. 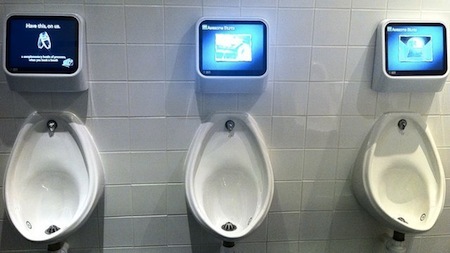 What do you get when you mount some Windows 7 powered tables above urinals? A pee powered collection of video games for guys that get bored really easily. My first thought when I saw this was: Hang on, other guys are going to touch their junk, then touch the screen, and them I’m supposed to touch the screen? Why don’t I just go ahead and touch their junk directly? The good news is that you don’t appear to need to touch the screen to play, as it automatically senses your activity. Still, I spotted a screen with high scores – how did those get in here?